Zenith High Back Mesh Office Chair with Adjustable Armrest Lumbar Support Headrest Swivel Task Desk Chair Ergonomic Computer Chair (Black) by Zenith at Momiji Studios. MPN: M02. Hurry! Limited time offer. Offer valid only while supplies last. 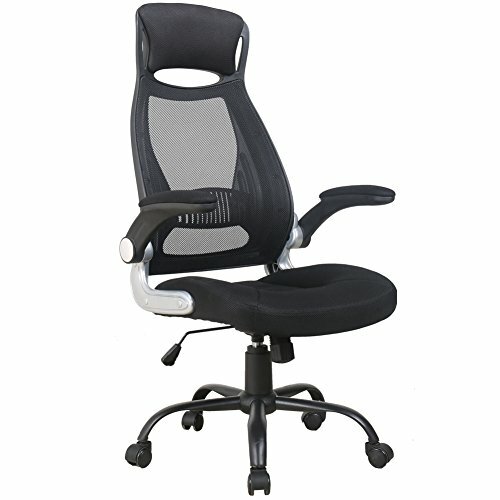 Built-in lumbar support and headrest help you been in right sitting posture for protecting your neck and waist. Integrated frame is stable and durable for using and contoured breathable mesh back make you feel comfortable during long time working. Tilt Lock Mechanism with Tilt Tension Knob and Pneumatic Seat Height Adjustment will match different stature. Fold up arms will be suitable for different scene. Heavy duty base with smooth and silenced rolling PU casters. If you have any questions about this product by Zenith, contact us by completing and submitting the form below. If you are looking for a specif part number, please include it with your message.